Welcome to this week’s (slightly delayed) clicks! Let me know which articles you’ve been reading. And if you have any suggestions for links to share, leave a comment or shoot me a tweet! Let’s jump right in! This was a controversy in 1968. For context, it happens a month before MLK is assassinated. 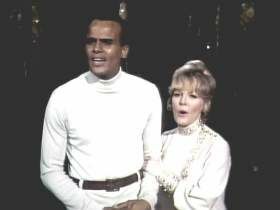 Such a torrid romance [re: Scandal’s Fitz/Olivia] marks a head-spinning change from 1968, when, during the taping of a duet for her NBC special, British pop singer Petula Clark clasped the arm of Harry Belafonte, the beloved calypso star and social activist. It was a gesture that spurred the sponsor, Chrysler, to demand this instance of “interracial touching” be edited out. The emphasis is mine, because wow! I know that there were such strict rules on television back then (I mean, Lucy couldn’t even say she was pregnant with a baby she got by sleeping in the bed next to her husbands! ), but for the sponsor to want an arm touch edited out…! Seems so silly. “Interracial touching.” Tch! ♥ I shared a piece by this author, Eric Haywood, last week about banning the word “aspiring” from your vocabulary as a writer. This time, I’ve found another bit of searing Haywood advice: “If you stay ready, you don’t have to get ready.” The article is about having work ready to show someone always, at a moment’s notice. I am still working on having one thing finished, much less a constant flow of work-in-progresses, but it’s still important advice that I need to let marinate. Because as a writer, I should never be done writing. There are times when I am “finished” and something is ready to go off into the world (again, still working on that part), but then I should already be on the next thing. As it is, I do have a backlog of ideas for certain things, they’re just, unfortunately, not all TV shows, aka the medium I want to work in. “But that means you should already have a current piece of submission-ready material available at a moment’s notice.” As a chronic procrastinator who often needs deadlines to work, I need to work on “staying ready” more than “I can do it later if you tell me when it’s due.” Writer!Connie still has a lot of work to do. ♥ This article, “What is a Universal Story Anyway,” is fantastic with regard to discussing what “universal” means and how it silences so many stories. I’ve plucked out some great quotes. Please check out the entire piece because I never thought about the term “universal” in such a way. My favorite quote, “It’s not our job to cater to the lowest common denominator. It’s our job to raise,” (from The West Wing) definitely fits in with the jist of this piece. ♥ As January passes us by, February into spring means the peak of pilot season! Shows are being picked up for pilots, names are being attached to projects, and soon enough, production will begin on the slate of offerings for the 2015-2016 season (already!?!). Between the midseason premieres, summer limited series, and the onslaught of Netflix/Hulu/Amazon shows we’re expecting, this is a list of a few nerd-friendly TV shows that are coming this year so far.